If you follow me on insta you will see if I touched on this topic a little bit, but I wanted to dig in even further on it just cause I feel its something a lot of women deal with but its not really spoken about. 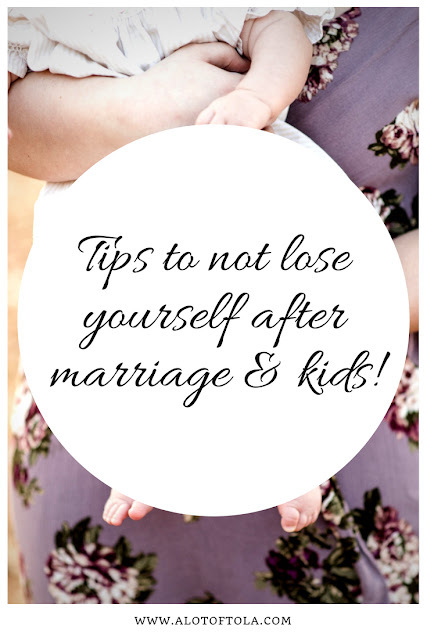 After having kids, I spent about 4 years getting back to who I was before having children and then I got married and that person I used to know felt like she got even further lost. As a women, it almost feels like we are constantly giving of ourselves, making sacrifices and when you get married and start having kids it feels like those sacrifices double in size and before you know it you start to lose yourself and give too much of yourself to even give back to yourself. I became a mother at a pretty young age, I was 23 years old when I had Simi and it was at quite an interesting age for me. You know right at that point when you are just starting to enjoy that young adult life, its so selfish thinking back now but the fear of losing myself was one of the main reason I didn't want to be a mother in first place. Feeling like I would have to give up so much of myself and my time to be the best mom. That mentality was already the one I had and because of that I stopped doing for myself, or even having any type of me time, then I became a wife and that idea doubled because I wanted to be the best wife. Society has put the idea out there that as women we have to make scarifies in other to be best mom or best wife, which yes you do have to make sacrifices but I am learning now those sacrifices don't necessarily need to be at the expense of yourself and completely forgetting about yourself, if anything I wish the idea that putting yourself first when you take on the role of mother and wife would be promoted more because honestly you can't love your kids and spouse properly if you are not loving yourself twice as much. One thing I have learnt in my journey to getting back to that woman I was before the title of wife and mom came along is, its very very important to take and make time for yourself! With so much happening and life moving so fast its so easy to put everyone's wants and needs in front of mine and completely forget to take some time for myself. Taking little mental breaks is imperative, and asking for help. I am the worse at asking or taking help, but I have learnt that if I keep pushing myself I am bound to burn out. Another thing is knowing that I am most likely never going to be that woman I was before the tiles came along, but instead of living in the idea that that person is dead and gone instead accepting this new person with this new age and being a better version of myself before the titles came along. Taking the time you need and knowing that my process is different from the next woman and learning to be OK with that. Everyone deals with things different and so what works for one woman, might not necessarily work fro the next. The reality is with new chapters in life, brings on new shifts and changes, especially with motherhood the changes are emotional, mental and physical and its very easy to be consumed by those changes and live in that and just let it change you completely from who you were or learning to take it for what it is, knowing that this is all part of the process and knowing that this too shall come to past and not live in that. Tola, I have to agree with you. The woman I was before kids would have a nervous breakdown. You definitely evolve and change when you become a mother. The hard part is finding the balance and finding time to take care of yourself.